This was a powerful thing for me to post, because even when I try to make myself out to be a strong individual, sometimes, my weakness is my insecurity and self-doubt. This year, I downloaded an app that sends me an affirmation everyday. I try to look at it everyday, and save ones that mean the most to me, so that I can look back on them whenever I may need a positive boost. This one spoke to me on one of my lowest of days. It was such a simple thing, but it meant so much. On the day that this affirmation popped up, I was going through a lot. I was pretty down on myself and really criticizing myself about a lot. My confidence was very low and I wasn’t thinking very highly of myself. This affirmation reminded me that I was worth something. It reminded me that every moment that I had was an opportunity to make the most of my life, and that I should be blessed no matter what. 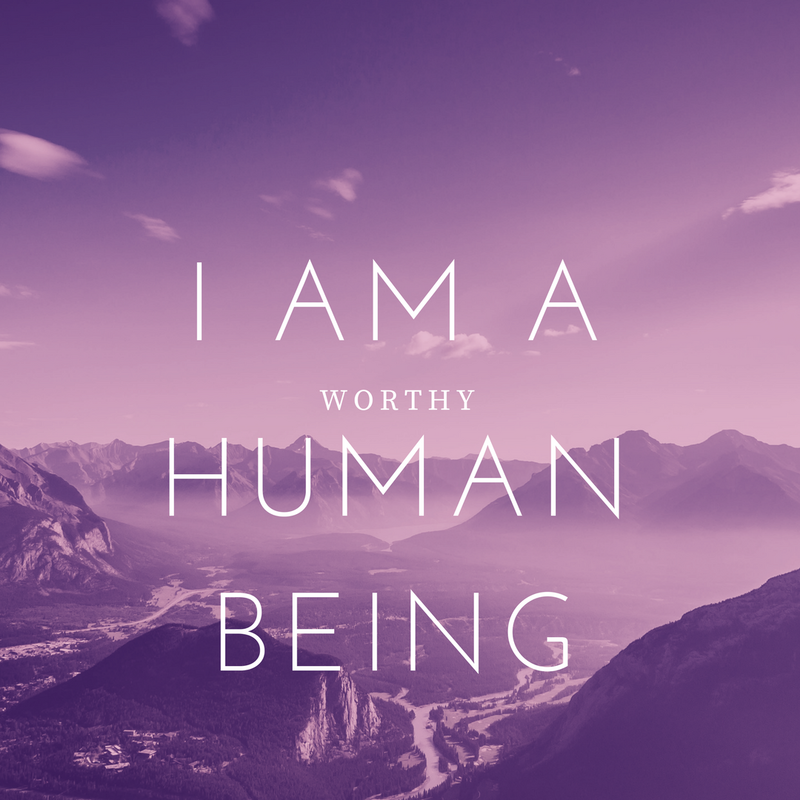 I hope that this same affirmation helps someone else today or any other day that they may be feeling down; if no one else lets you know, please know that you ARE a worthy human being! Contrary to popular belief, I am an awkward bird. I’m ashamed to admit that as I approach 30, I feel more and more insecure about myself. I have yet to find a level of feminine comfort and security, and there are days in my life where I feel completely awkward and misplaced. I have self-confidence issues a mile wide; ones that have been present for years that I just cannot overcome, and fearful that I will never overcome them. Confidence and my personal self-image has always been a sore point for me. I perceive myself to be a very quiet person, but pretty social once you get to know me. You would even think that this is something I don’t worry about on a regular basis, but it happens. Body and self-image is a deep part of my soul that needs some serious work; and it’s been that way for years. I see confidence, positive body image, self-love and all things alike everyday. My friends, my family, even people on social media (although I understand can be subjective) all have a specific demeanor that exhibits self-love and appreciation for themselves the way they see themselves. I ogle over women of all shapes, sizes, colors and nationalities loving themselves, and then here I am, sitting somewhere in a far off corner, wondering why I don’t love myself. Until I can learn that phase of life, nothing else will seem to be enough; I know this, yet I still struggle daily. A lot of this has to do with my weight, and how for 3 years now, I have struggled with losing or maintaining. I place all blame on myself, because there are times that I am not consistent, or dedicated to the cause. I have also recently discovered I am an emotional eater; which means, when I’m not happy with my weight, I eat. Bad combination, right? I know! My weight has been a roller coaster issue since I had my daughter. I’m no longer in the grace period of blaming my flab on baby fat, as my daughter will be 3 this April. Needless to say, I have to remain committed to changing my weight but in addition to that, I have to learn how to not eat my feelings. Or if I eat them, eat healthy things, lol. This leads me to my next revelation: I hate clothes. Dresses are the devil and I’ve felt that way since I was 13. From middle school all the way through my senior year of high school I was a tomboy. I played sports, I wore basketball shorts and big t-shirts, baggy jeans, jerseys, sneakers (Air Force 1’s had to be my all-time favorite), the whole nine. What’s interesting about that is I still religiously wore jewelry, got my nails done and my hair done. I was a complex person, but my style was one of comfort. It was the best of both worlds to me and I felt like my best self that way. Now, fast forward about 10+ years: I have a government job, I’m a wife, a mother; I am adulting every day, and that requires me to have a certain amount of dress down- casual-business casual clothes in my closet. Can I be honest with you guys? I hate that. I wish I could walk around in leggings and VS sweatpants all the time. Workout clothes make me feel ok as well. My mother and I would have knock-down drag out brawls about me wearing skirts and dresses (and truth be told that hasn’t changed) and I just refuse to. I have very VERY rare occasions where I will say to myself, “Self? Let’s wear a cute skirt today” or “how about we bring that dress out for the spring time, it’s so nice out and the color is really pretty on your skin”. Other days, I am merely wearing them out of force, and to see my loved ones happy. Everyone sees me differently than I see myself. My insecurity has brought me to low places at times, but overall, it just makes me feel like the awkward ugly duckling in the room. I don’t wear makeup, and even wearing lipstick makes me feel like I look like a clown. I feel in constant competition with other women to look as good (never really better because I know myself) as they do, and most times I feel like I will never compare. I have daydreams of certain styles or outfits that I would want to try and once I try them on, they look like a disaster; so they are never purchased. I cannot stand trying on clothes in the store, for the mere fact that disappoint waits on the other end of that dressing room door. To be honest, it’s painful to write this. It’s painful to see the words in black and white and bring this to light because I have hidden it for so long (and even this post doesn’t explicitly tell the entire story), but I feel like in order for me to begin a process it needs to be made clear. I need to be able to write about the most vulnerable parts of my life, because once it’s out there, I need to fix it. Putting this out for the world to read helps me take a step towards trying to change it. Would I be comfortable the way I am; being shy and hiding out in the background feeling horrible about myself? Sure. Is that the best way to be? No. Why? Because I have someone looking up to me, trying to learn how to be comfortable in her own skin and love herself. How can I lead by example, when my example is not the best one to follow?